Posted: March 16, 2017 in Who,What,Where & When...? I’ve always had a sense of the history of the place, as a competitor you get a twinge of excitement the week before and as you cross the bridge from San Remo to Newhaven on the Island itself your sphincter twitches a tad such are the speeds of the circuit. My top gear at Winton short circuit is third in my Van Diemen Formula Ford at the Island, you are motoring fast there even in a car without a surfeit of power. The meeting has become ‘Bigger Than Ben Hur’, too many entries actually, yer don’t get a lot of bang for your entry fee buck these days but it’s still one of the great Historic Meetings in Australia. There are always a few ‘furriners’ who double enter their cars at the Island and Albert Park for the F1 Gee Pee historic event so there are plenty of different cars to see each year. I’m not racing this year but I have been helping ‘me mate Andrew McCarthy prepare his Ralt RT4 Formula Pacific for the rigors of the weekend. Ron Tauranac is regarded by many of his peers as the ‘High Priest’ of production racing car designers, ignoring the two World Constructors Championships his bespoke Brabham F1 cars won in 1966/7! 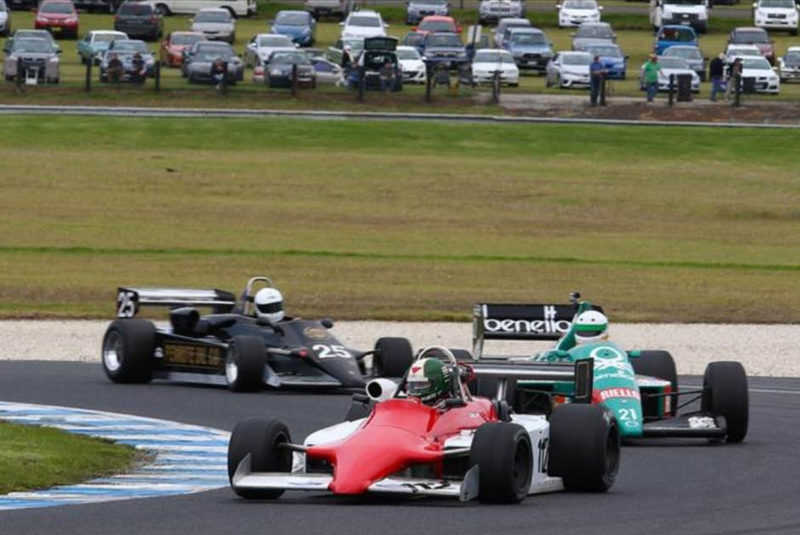 The Ralt RT2/3/4/5 F2/F3/FA-Pacific/FSV cars are one of the great series of customer racers of all time. They were winners for lots of customers in all of these classes across the globe in the 1980’s. 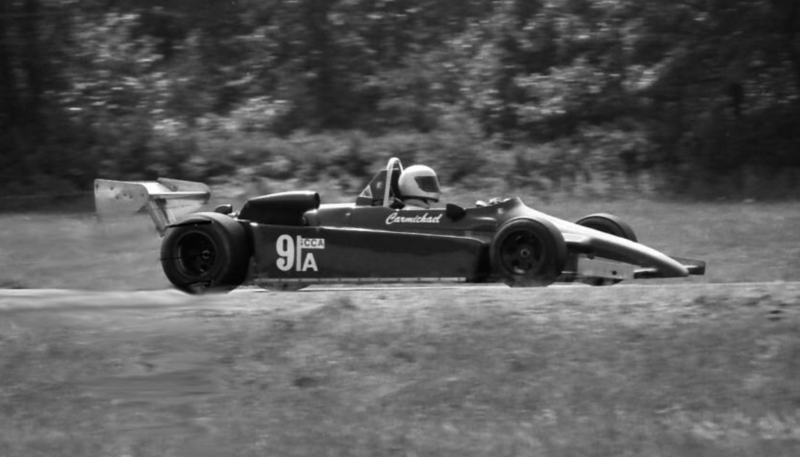 The Ralt RT4 pretty much did to Formula Atlantic/Pacific what the Lola T330/332 did to F5000, that is, help weaken the class for a while such was their dominance. I will get around to writing about these cars in detail eventually, RT4 ‘261’, the 1981 Australian GP winning car driven by Roberto Moreno I owned for a while so I won’t prattle on about the background to these cars now, i’ll save it for the article on Roberto’s racer. For every RT4 driven by a hero ten were sold to normal customers whose bums pointed to the ground in much the same way as yours and mine. McCarthy’s car ‘354’ is one of these cars, a 1982 chassis, the first RT4’s were 1980 models; it was sold to Dan Carmichael a ‘doyen’ for decades in American SCCA Club Racing. So in the pantheon of drivers he is somewhere between a hero and a regular customer! ‘Fatlantic’ on TrackForum.com said of Carmichael ‘…without a doubt THE MAN in club racing and perhaps of any sport was Dan Carmichael. He…was still a winner and national champ in the fastest SCCA class of all, Formula Atlantic at the age of 80++!!! But thats not all, Dan was a WW2 fighter ace (Hellcats) and then flew jets in the military until the mid 1960’s when they threw him out because he was too old’. ‘Then he took up racing and for the next 35 years won several championships and races usually in very fast sportsracers and formula cars. But there is more, the very first live televised sports event was a college baseball game in the 1940’s, Dan Carmichael was the winning pitcher for Princeton! In the early 1980’s Dan was the Ohio state amateur golf champion (not just for his age bracket). He had a successful engineering firm and was the president of the Columbus Chamber of Commerce for many years and was a winning tournament racketball player until his 80’s when his knees got too bad’. ‘…Always a true gentleman, when I raced against him if you pointed him by he would politely wave as he blew past you. I used to wait until I knew we were coming up to a busy part of the track, but he never forgot to wave, he must have been driving at 150mph with no hands on the wheel, at 80 years old!!! A TRULY great man and a role model for all of us’. It would be great to hear from any of you who know about Carmichael. Dan first raced the Ralt in October 1982, crashing it badly enough 12 months later to need a new tub which was built by Mark Bahner in late 1983. 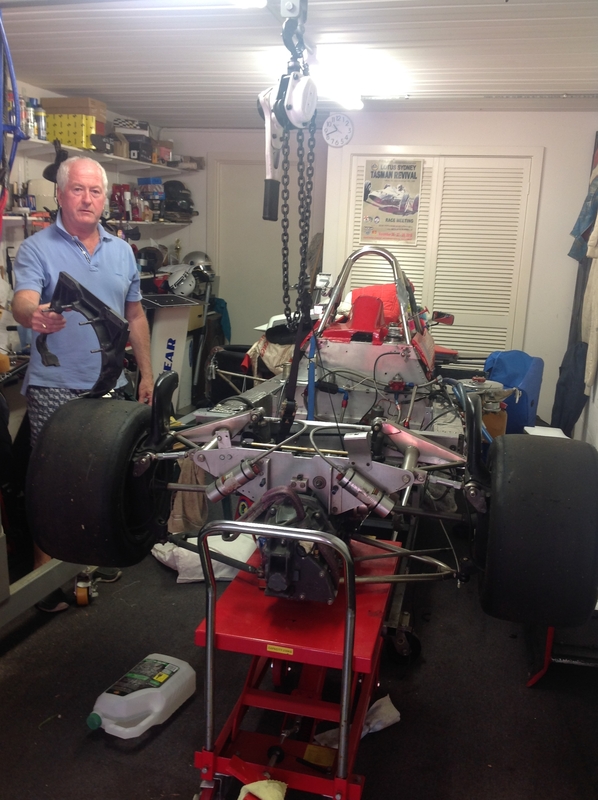 The car passed through several hands in the US before being purchased by one of the ‘Doyens’ of Australian Historic Racing, former national Formula Ford Champion Richard Carter circa 2002. Richard ran at the front of the fields in the very well developed car before selling it to Matt Lloyd in WA, Lloyd sold it to Andrew not long before his untimely demise in 2008. McCarthy is a pretty good mechanic for a stockbroker and prepares the car in his home workshop in a twee inner eastern Melbourne suburb. The setup is small but works fairly well, mind you, the passing parade of lissom young Armadale ladies working out in the park opposite is not particularly conducive to the concentration levels needed for the important car preparation task at hand. Peter Brennan of ‘Racers Retreat’ fame (click the bar at the top of the site) provides lots of advice, not that he says Andrew listens to much of it, and specialist capability inclusive of engine maintenance. That’s been the major task this week, the Jennings built ‘big valve’ Ford Cosworth BDD 1.6 litre engine ingested a washer which helped retain the air intake ‘snorkel’ to its baseplate at Winton in May last year- whilst huge carnage, ‘nuclear fission’ inside the engine was avoided prudence suggested it was a good idea to pull the engine out and send it off to PB, who is not too far away in Burwood. McCarthy holding his bell-housing above, RT4 awaits its engine. The engine bay is big, there is plenty of space for a variety of engines and moving them backwards and forwards in the monocoque chassis to alter weight distribution as needed for different classes or as ideas about such things (weight distribution) evolved from year to year. Compare this shot with the one below and note how the whole rear end ‘wheels away’ obviating the need to realign the suspension if time is short- which it is in this case! Tauranac used aluminium ‘legs’ or extensions either side of the main chassis section to attach the engine rather than a tubular steel subframe. You can see by reference to this shot (below) and the one above where the aluminium cross beam attaches, with the rear end attached, via 4 high tensile bolts each side, to each of the ‘leg extensions’. See the mechanical tach drive (photo below) off the back of the exhaust cam, 48DCO2 Weber carbs (fuel injection was not allowed by the FA regs) and inlet manifolds which are Jennings own castings. The dry sump tank is to the right of the ‘right leg’ with a red cap. In front of it is the dull yellow coloured plastic oil catch tank, you can just see the slim, red battery mounted flush along the side of the ‘leg’ extension. Clutch is a twin-plate Tilton. When the car was rebuilt after its ’83 prang Carmichael fitted ’83 spec RT4 rocker rear suspension (above) rather than the earlier (‘80/1/2) simple conventional coil spring/shock unit which was cleverly done by RT, but the rocker setup cleans up the airflow thru the all important ground effect tunnels even more. Calipers are AP-Lockheed, discs cast iron. Brakes went outboard at the rear in the G/E period again to keep bits and pieces outta the sidepods where they mucked up airflow. See the canisters for the Fox adjustable shocks- this photo shows just how independent from the rest of the car the back bit is. 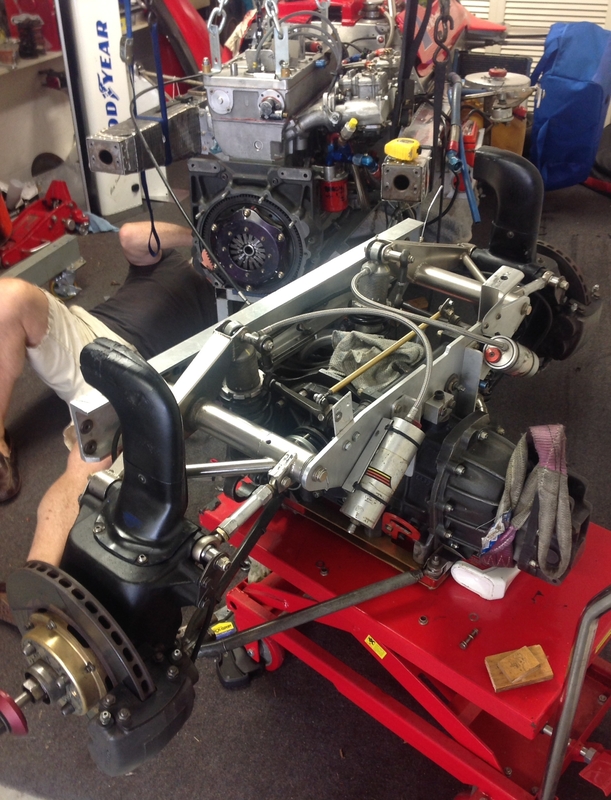 Gearbox is, of course, a ubiquitous Hewland, the FT200 pretty much de-rigour in F2 since 1967. Andrews is FT200 #1561, I wonder if that means Mike Hewland’s amazing Maidenhead (its worth a visit to the factory folks) outfit had built 1561 of these ‘trannies between 1967 and 1982?! Look closely under the box and you can see the gold coloured frame to which the lower wishbones on either side mount. 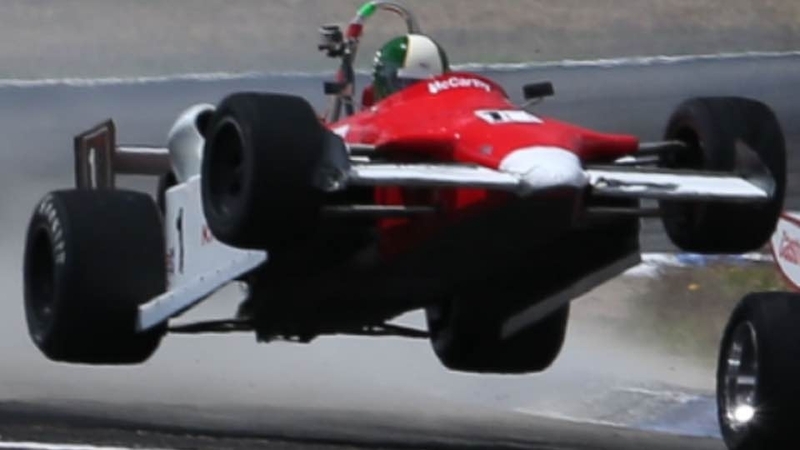 This attempt at aerobatics at Winton in 2013, impressive as it is was Andrew, was not conducive to survival of ‘354’s second chassis and so it was off to Mordialloc to have a chat to Mike Borland about repair. The builder of Spectrum Racing Cars diagnosed a crease from McCarthy’s ungodly rear end assault upon another competitor and other wear over the decades from previous misdemeanours- replacement of the tubs inner and outer aluminium skins was the only option, the quality of the workmanship superb. As of this Wednesday evening, the car loaded up, so with luck our hero will be on-circuit on Thursday.